This is the picture of my niece Titir. This is the first time I met her and she was already so big. My trips to Kolkata are so rare that probably the next time I meet her she would be a big girl. But I am glad that I met with her to treasure atleast one picture of her and lots of moments to cherish and remember. This is a pic of a tea stall in Kolkata. Interestingly this pic was taken at the pinnacle of general election and has the posters of two political leaders waving at you from the corner of the pic. Kolkata is a politically charged place. Anybody and everybody there has an opinion on the political scenario….. The three topics that everyone there talks about over a cup of tea at an ADDA (get together) is weather, politics and their wide range of illnesses…… and ohhhh I forgot Football!!! Tea stall like this one is a predominant feature in the corner of most streets of Kolkata. The tea stall owners also sell biscuits, chocolates, mint, cigarettes and sometimes some fried eatables to accompany the tea and a paraphernalia of eatables. This tea stall is close to my mum and dad’s home in Kolkata. I like this pic especially because as a kid i used to love going to this shop. They had these sweet and sour lollipops made with tamarind and jaggery and cumin which I used to love. In my vacations my aunt would buy me two biscuits from this shop every evening. Sometimes she would give me a coin and ask me to get two biscuits for myself. The shop has since then changed hands a lot of times. The initial owners I remember were my mother’s childhood friend so I would get lots of freebies. 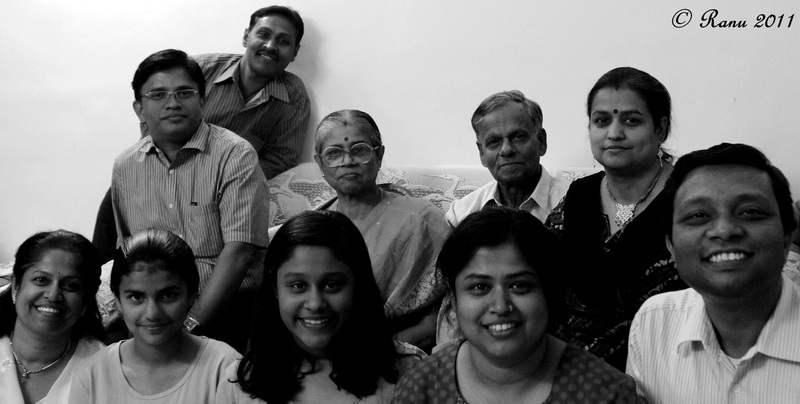 Going to Kolkata during holidays was fun. My mum and dad live closeby so everybody who lived in and around mom and dad’s place were related to me from either side. Either that or they were my mum or dad’s friends. So as soon I would go there people would ask me when I had come for my visit. I was known to all by face. This was a contrast to living in the city where nobody knew you. I resemble my mom too much…… so much that in that place I needed no introduction. Things have changed these days. The entire demographics of the place has changed. The oldies have either passed away or they have moved for better opportunities in other cities. It is not the same anymore. When I was younger I could knock on any door and just have a glass of water or be welcomed in their home….. made me feel I belonged there. Not anymore….. it doesnt feel like home anymore…… nor do I long to go back there…… in the instances that I have held on to memories and gone there, I have returned disillusioned. My grandparents have passed on and my uncles who were close to me have either passed away or are too old to understand my presence. But yet the place holds the first memories of my childhood…… and all of them happy. So it will remain close to me. I recently read a beautiful quote by Dalai Lama which I must share. I took this pic in one of the very narrow bylanes of Kolkata. 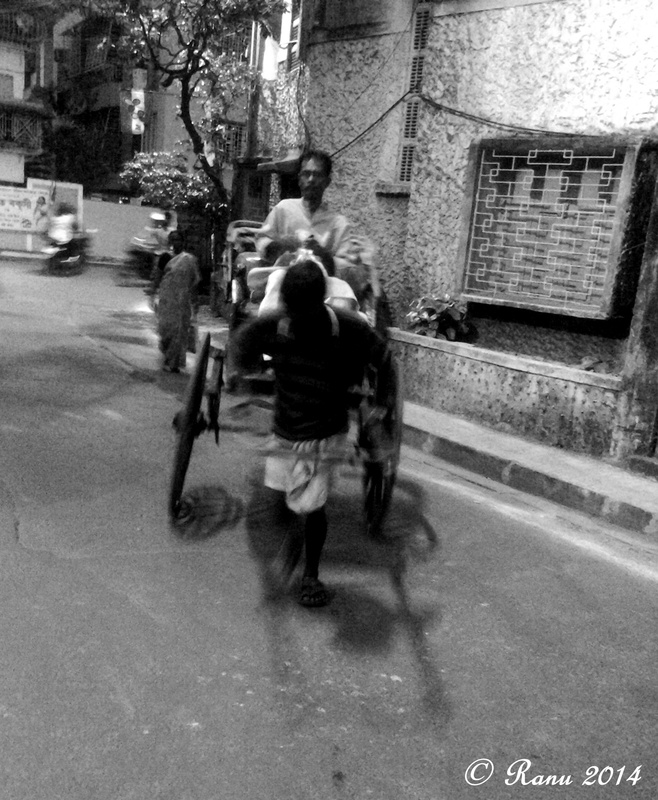 The hand pulled rickshaw still runs in some parts of Kolkata. The lanes in these areas are so narrow that it would have been congested with the auto rickshaws. These are pics from my trip to Kolkata last week. With the mercury hitting a high of 40 plus degrees Celsius, it was difficult to venture out to take pics. In the few occasions that I tried…… the camera malfunctioned because of the excessive heat plus I was actually melting in the sweltering heat. The rickshaws that I clicked were too fast to capture on my cell. This pic is of my aunt when she came to meet me. She had hired a rickshaw to take her to and fro. I took this opportunity to take some shots….. Also the rickshaw puller agreed to get photographed as he waited for my aunt. The third pic I took with my cell. A Bengali babu travels in one of the rickshaws in the bylanes. It has the rickshaw puller in motion and running. They are too fast and in very less light it was difficult to take good shots. I mono-chromed it to get the old world feel. Kolkata seems so much unchanged every time I visit that the constancy comes alive in the monochrome. 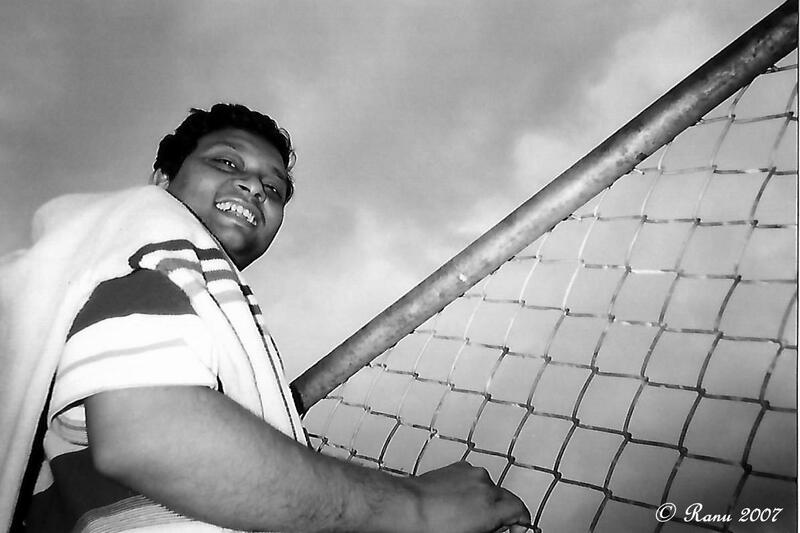 The vibrant Bengali colors are of-course missing but the black and white gives the pic a different feel that I like.